Bordeaux is located in the southwestern part of France and near the Atlantic coast where the Greatest Grape Garden were found there. After Paris, Bordeaux has the highest number of preserved historical buildings of any city in France, and it’s UNESCO World Heritage Site. Grand Theater of Bordeaux built by Victor Lewis in 1780, which received the Grand Prix of Rome for this incredibly beautiful building. This building is one of the largest monuments in France with twelve separate columns, which decorated with statues of Greek goddesses. Grand Theater is one of the most popular and most visited opera and theater in France. Quinconces square is largest square in France and one of the largest in Europe. It was built from 1810 to 1828 on the site of Trompette Castle. The square is composed of an esplanade descending gently towards the Garonne and surrounded by planted walks. There are the monumental statues of Montaigneand Montesquieu by sculptor Dominique Fortuné Maggesi in white marble, which were placed there in 1858. 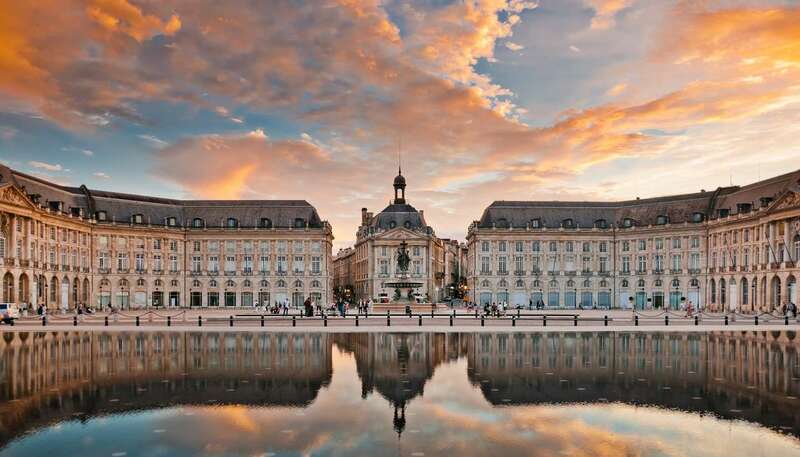 Place de la Bourse was built between 1730 and 1775 by Jacques Gabriel, at the Garon River in Bordeaux. This building, which is one of the main symbols of the city of Bordeaux, represents the classical art of French architecture in the eighteenth century. Bordeaux Cathedral, is a Roman Catholic church which dedicated to Saint Andrew’s Church. Architecture of Bordeaux Cathedral is Gothic style.